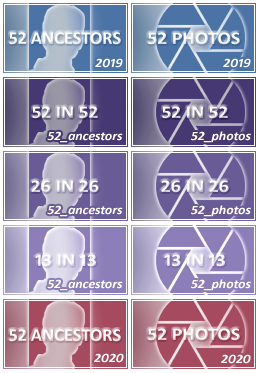 Ready for week 12 of the 52 Photos challenge? Members who participate every week can earn challenge badges. Click here for more info. If this is your first time participating, or you don't have the participation badge, please post here. I could have sworn I answered instead of commented! Will try to post to an answer. Rats, I've got nothing even vaguely related to transport. Could you add to your blurb above that after someone adds the photo to the free-space gallery they need to copy and paste it into their answer or we don't know what photo on the gallery associates with what answer and don't see it in the answer. OR is it the purpose that we have them only on the free-space gallery and not in the answer below. I'm confused. Hi Eowyn, This really got my attention! I put up two photos (copy/pasted them and made a note about them. They showed up and then disappeared. What did I do wrong? They do not NEED to be posted into the G2G answers, if a link is provided to the free space page. Just so long as there is a connection - either the photo itself or a link to the photo. Thank you, Robynne, that helped. That helped! Also found it was there .. on page 3. 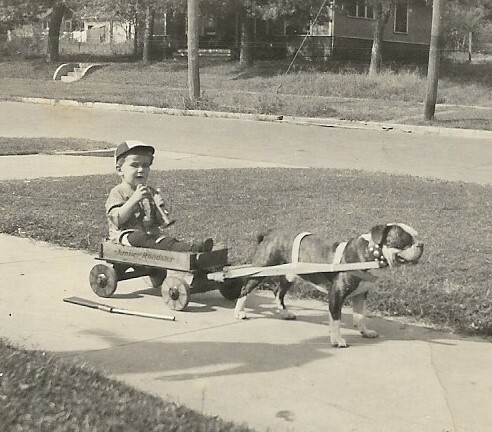 This is a 1922 photo of my father, Clare Alexander Lovelace Jr., in the front yard in Muskogee, OK with his wagon and dog for transportation. That's great! What a cute photo! Such a classic photo from that era. Thanks. Thank you Laurie. This must have been a favorite photo of my grandmother’s, as she made a paperweight out of almost this exact photo. In that one he has the horn in his mouth and is looking more straight forward; the dog is in the same position in both photos. Thank you SJ for your comment. Thanks Keith this photo sure makes me smile. Glad you like it too. I *LOVE* this picture. So funny, and so cute! Thanks for sharing! Thanks Lynn, I owned the house where this was taken. I got it in a foreclosure. The neighborhood is not good, and I sold it in January. The new owner is wonderful and is restoring it. These two mules weren’t just for farm work. They also provided transportation for both of these fellas as neither ever owned an automobile. Left to right: Uncle Math Underwood (1887-1961) and his father, Sid Underwood (1846-1923) . Photo ca. 1916, Paw Creek, Mecklenburg County, North Carolina. Great photo Pip. Horses definitely had to do multiple duties. Nice snapshot of history there. I imagine they felt about cars the way I feel about cellphones. Nice shot, Pip. Pip, these two fellows look like they worked hard. Glad they had the mules to help and then transport them home. Thanks for sharing. I have a pre 1920 photo that is almost exactly the same as yours. My husband's Great Grandfather raised mules in Huntingdon, PA. Thanks for sharing. This is a photo of my husband's maternal grandfather Alton "Jack" Armistead. His father, Harry Bland Armistead was a fishing boat captain on the Chesapeake Bay. "Grand Dad" was raised on the water and he never lost his love for it. 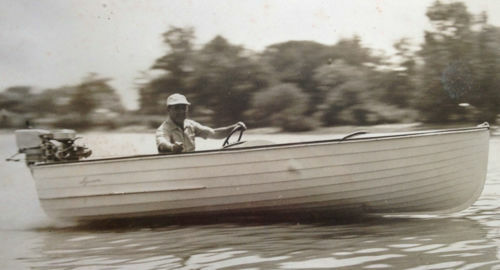 Fast boats were among his favorite toys. He was a loving and caring man. We miss him. Thanks Susan and SJ. He was probably hitting 25 knots or so (30 or 40 mph) when the amazing photographer captured this shot. Jack's pleasure at being on the water is so apparent in this pic. Thanks Caryl. Nice boat! It looks like Jack's having a wonderful time. Thanks for sharing it. 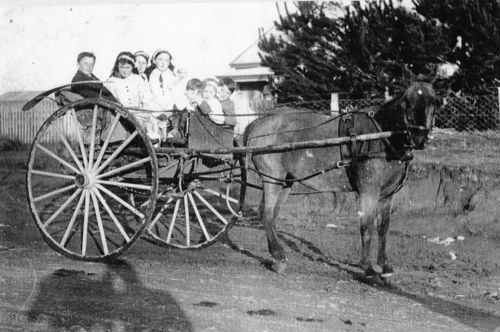 My mothers father (Bill Ledingham) as a young boy going somewhere with his siblings in 1917. The place is Otautau, Southland, New Zealand - a small rural town. Bill is on the far right, closest to the horse. The horse's name was Star. PS there are 7 children and one baby on this wagon - for the record. Really nifty photo! 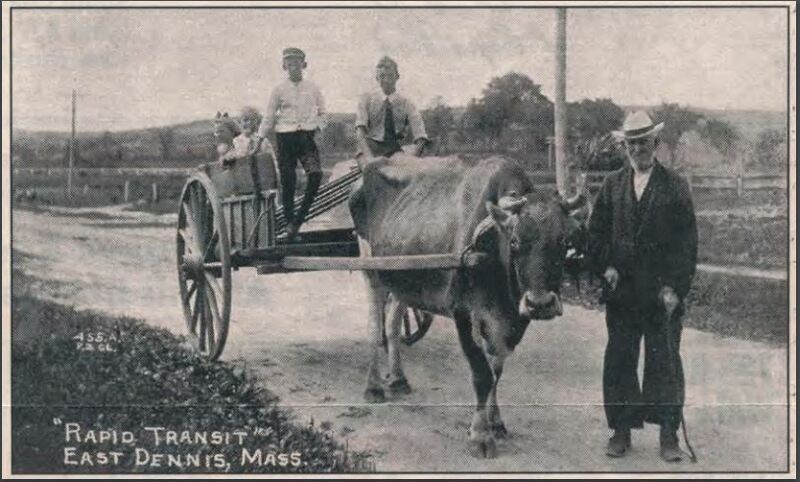 A reminder that while transportation has become more technological, the photo exemplifies share human experiences. Thanks! Carol (Baldwin-3428). Crap! I did it again! Members I know are starting to blur. Brain damage. What I love about this photo is that the horse has a name, and it was remembered.! I’ve had moon sickness for years. Just ask my wife! Do they ever! Wonderful shot. What a great cart! I'd love to have a ride in it. Thanks, Robynne, for sharing it with us. Linked mine for the week. 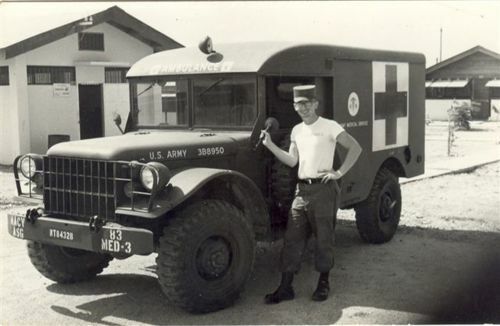 My father, SP5 Raymond Marshall, with one of the 83rd Medical's Ambulances about 1964 Vinh Long, Vietnam. Don't forget to ADD the link in your G2G post as well - which I have done so here. By the way, that's waaaaaay early in the war, first year if I remember correctly. Thank you SJ! I couldn't get the photo to post here yesterday. You are correct, my Dad arrived in at Vinh Long Airfield in April 1964. I think the 114th Aviation Company arrived there in May 1963. What year was this, Susan? Do you know? Great pic - I see your family loved animals! Susan, do you think we could all join you on the road trip? Nice car, nice dog, beautiful mother! Wonderful photograph Susan. 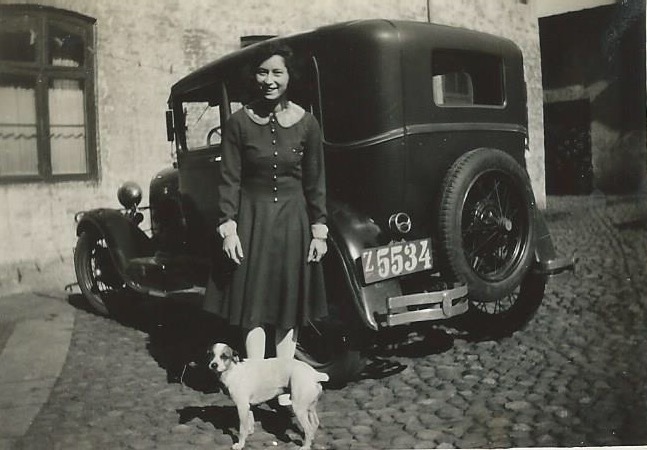 Love the dog, her dress and the cool car. Thanks for sharing. 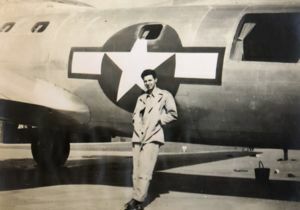 James Vretis, USAF pilot, a few months before being shot down in the Korean Conflict, 1951. Wow! Did he make it home? Great photo, Alex. Interesting how that surname changed over time. And yes, the his name changed from one generation to the next. His father was born in Greece, and changed his name when coming to the US. He dropped the last half of the surname, and no one knows what the full Greek spelling of his name was. 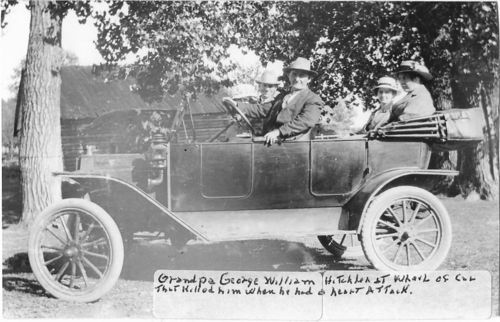 Great-great grandpa George William Hitchler and his car. The note at the bottom! The comments in the article announcing his death are a commentary on what a good man he was. Indeed, I haven't read that in a year. What a remarkable man he must have been. 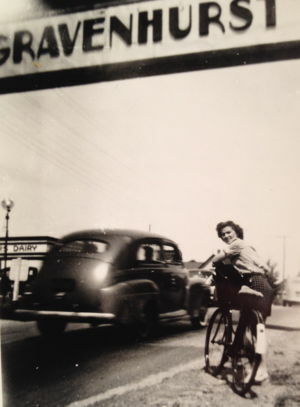 During WWII, while my father was overseas, my mother and a friend took a 214 km bicycle trip along Highway 11 from Orillia to North Bay in Ontario. I don't know how she did it. The bike was incredibly heavy and she was so tiny. What happened here? I get a box for a photo, but no photo. Oh no, I've messed up again! I can see it, but I just realized that the profile is private, so that makes the photo private. Thanks for letting me know, Judy. I'll see what I can do. I did the same thing last week. Upload it to this profile page instead and don't mind that it is a duplicate. I managed to upload it onto the free-space page, but I can't seem to get it onto here. Arrrgggghhhh! Nice bicycles! And the women are wearing lovely outfits. I wonder if this is the reason that the bar on women's bikes slopes downward. Also wondering if their skirts were like culottes. Thank you for sharing this very nice photo. Thanks Robin, they are just wearing ordinary skirts (for the time) I remember riding my Mum's bike with a long skirt on when I was a child. It wasn't a problem - I loved dressing up and playing at being (historical) royalty, the bike was my horse!! I never thought about it but I am sure you are right about that being why the bar slopes downwards. Thanks Susan, glad you like the photo. 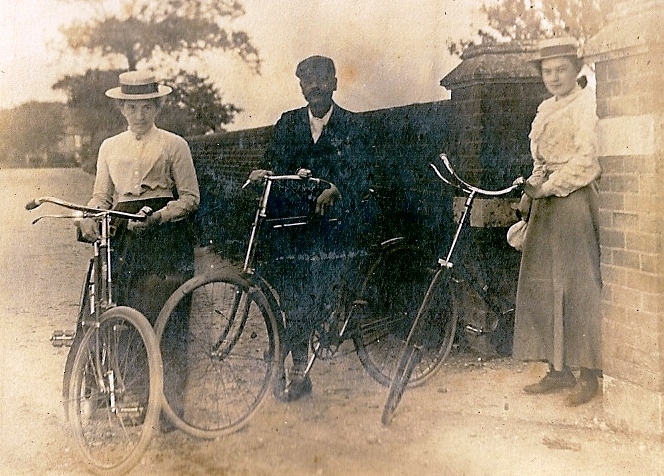 The trio loved cycling in flat Norfolk, they had recently moved there from Herefordshire/Worcestershire where there are steep hills. 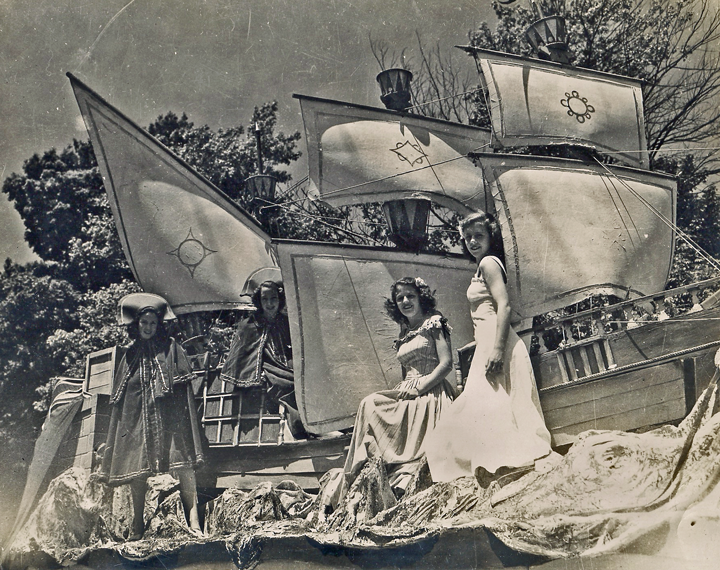 My mom, Lois Aitken, and her cousin Margaret Rice in 1946 on a parade float in Hamilton, Ontario, Canada. My mom is on the far right and Margaret is next to her. Cool pic. Looks like a lot of fun they were having! WOW! This is a great photo. Beauty Pirates of the Canadas! "Now bring me that horizon!" Thanks! Carol (Baldwin-3428). Thank you. My mom and her cousin were in dance and ballet from a very young age and participated in a lot of public events. Wow, that's better than any Rose Parade I float I saw in the 50s! Beautiful! ”Rapid Transit.” Now that’s funny! Which one is Isaac? 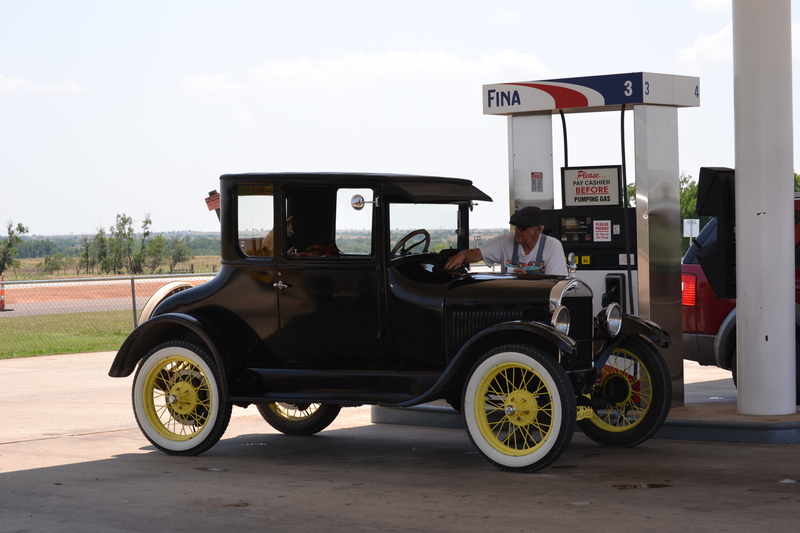 David and Kim enjoy dressing in period costumes and participating in classic car rallies. I get that you like cars! But it is nice. That car really is a beauty! Thank you Cheryl, Karen, and Susan. It seems everyone is attracted to old cars. This one is a real beauty and well-cared for. Ditto to what everyone said, especially Robin because me and my mother and dad just moved up to Greeneville, Tennessee that is my mother and Dad and I moved to Jonesborough, Tennessee since November 6th and 9th of last year. We don't have all of my mom stuff up here and my and mom's christmas decorations are still down there. 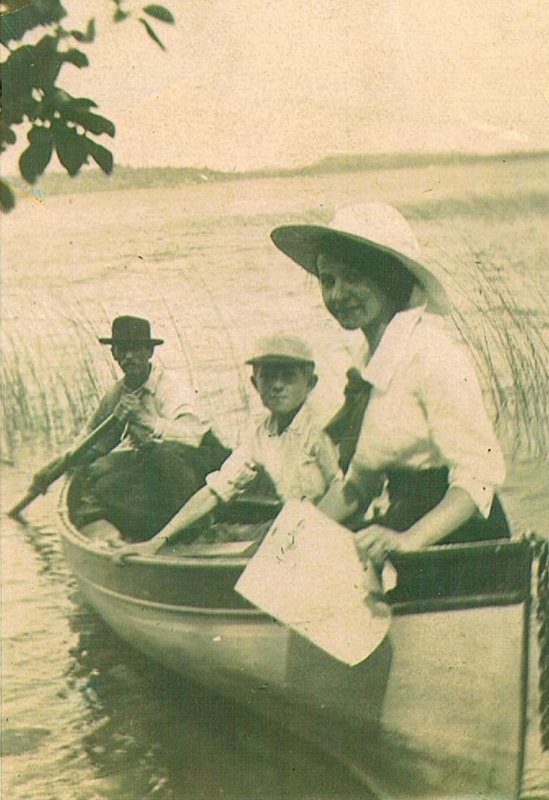 This is my great-grandfather, Arthur Mampel, boating with two of his wife's relatives in the early 1900s. He’s the one in the back? Yes. The boy's name was Victor Geissner and I can't remember the woman's name off the top of my head. 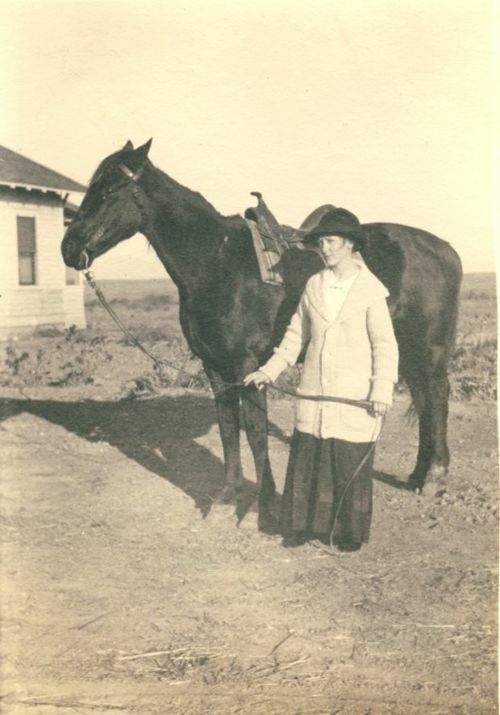 Here's a photo of my grandmother, Edith Forrey, in Idaho before she was married (around 1913), with her riding horse. 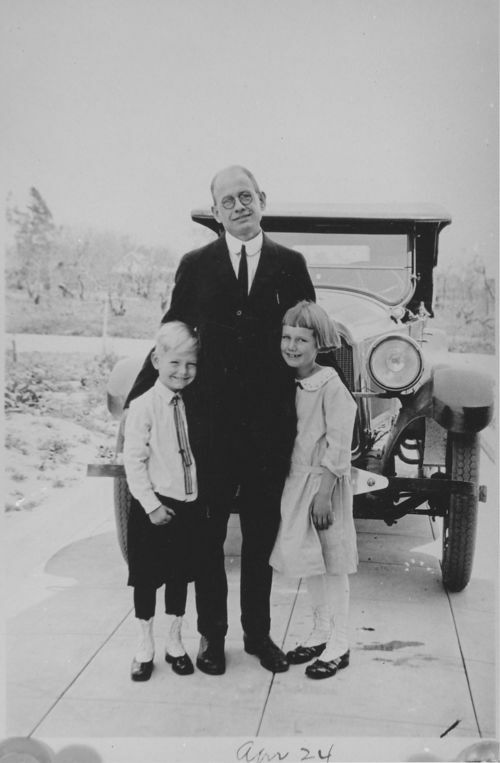 Below is a photo of her husband, my grandfather, Peter Stoner, in 1924, in Pasadena, Calif., with their 2 children (my aunt and uncle), and their Willys Knight car. My grandfather was so impressed with the car that he named his son Willis, or that was the story I heard. Lovely photo of your folks, both photos. Momence, Kankakee, Illinois, is known as the Gladiolus capital of the World. It was never truer than in 1938. Since 1938, our little city has hosted the Gladiolus Festival. There are hundreds of floats in the parade along with people on their bicycles decorated in gladiolus, marching bands, fire and police department vehicles and children dressed up in costumes. Up until about 20 years ago, we also used to have a Drum & Bugle Corp Contest with a pot of thousands of dollars. We still have a large carnival for adults and kids alike for three nights in a row. 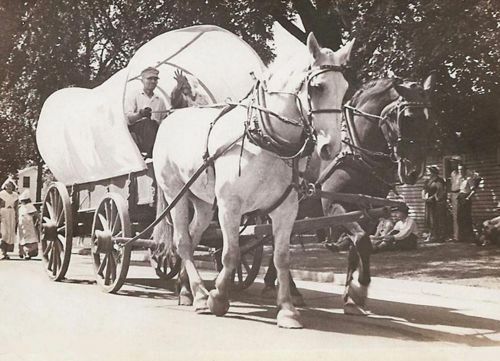 My picture for this week is one of the original modes of transportation back in 1938 in the Gladiolus Festival. I thought you would enjoy going back 80+ years to see this. Notice how big the animals are, and the hoofs of the horses. The horses in this area were not small, and several of the area farmers had breeding horses at that time. Those really are huge horses! And that town must be glorious when the gladiolus are blooming! Thanks for sharing this piece of history. 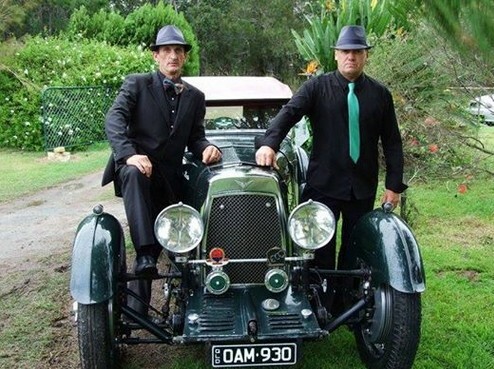 But I know how you guys just love your car photos, so here are two of my cousins leaning on an Aston Martin. I agree with Carol 100%. Nice photos. I agree with Carol. 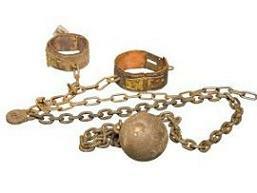 If I could vote this (the ball and chains) as the best I would. The car is beautiful. I had to put this photo up. Group fun 1920's style. A Day Out. A picnic lunch. Breakdowns and overheating would be a large part of the day. Myrtle Mayoh, my grandmother, is between the two vehicles, white dress and hat with dark tie. She didn't make it in the post (or, at least, I don't see the right half of the photo in your post). Hope you don't mind me reposting it, smaller, for anyone else who can't see the right side. Thanks Heaps Melanie, I'm blowed as to what I did. I think I put the url in the wrong spot. No, I think you got that right. It's just that the image is mega-wide for these little post boxes. 1720 pixels wide by 1234 pixels high. The height probably would've been ok, if the width had been smaller. I've noticed before how the post box cuts images if you don't scale them down. I'll remember that for next time and do some more help file reading, I think. The first photo was good, but it was also good to get the "rest of the story" as Paul Harvey would say. Great photo! Looks like a wonderful outing. I'm so happy that you are enjoying the photo. Everybody wearing a hat! What a great photo, David! A couple of the kids are barefoot. Just like kids, huh? 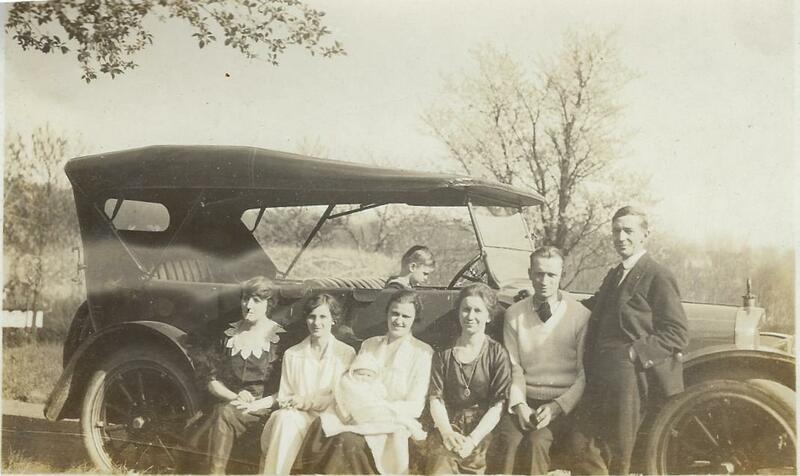 This is my husband's grandfather and various family members out for a drive in the wilds of New Jersey in the mid 1910s, judging from the car model. Identifying who is in the photo is more of a challenge. 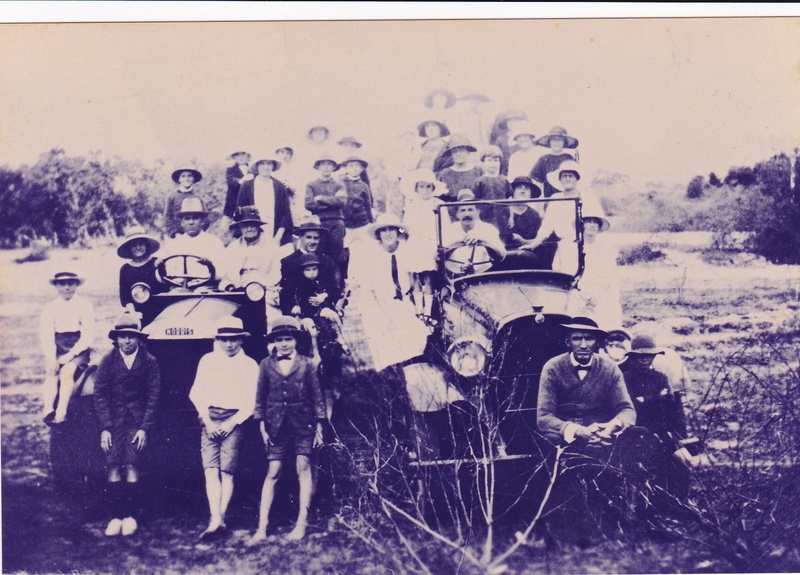 Assuming grandfather Howard took the photo, it's possible the people in the photo include his brother Forest, his sisters, his son from his first marriage. Hard to tell the age of the children, which if they are only 2 years apart would be my husband's mother and uncle, and placing this photo into the 1920s. Any automobile experts around who can identify the model? I was thinking a Stutz or Buick touring car. [e] After consulting with my husband, he believes the child sitting in the car is his uncle Howard Wiswall Bible Jr, the baby is Sheila Girdlestone Bible, the woman holding the baby is hubby's grandmother Irene Florence "Rena" Girdlestone, the fellow in the sweater is, indeed, "Uncle Peter" from Howard's first marriage, and the bloke in the suit likely is Forest. This would have placed this jaunt in the country around 1922. It looks like the child would rather be going for a ride, and be doing the driving. Lovely photo -- everyone looks like they're enjoying their day. Thanks for posting this. The "driver" could care less about the photographer. Very nice pic!